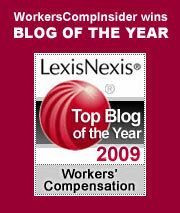 Workers Comp Insider is a weblog written and maintained by employees of Lynch Ryan. It contains frequent updates on news items, tools and resources about workers compensation, risk management, and related topics. The information changes frequently so you may want to bookmark the page and visit often. We welcome links to our site, or to individual weblog entries. In the main body of this page you will find short entries. Posts often include links to news items or other sites. The opinions in the posts are ours, but we often include a text excerpt of the story or page we are linking to. These appear in italics and in quotes, and are subject to any copyrights of the respective sites of origin. If you would like to keep a bookmark of a specific posting for later reference, click on the word “link” at the end of the post you want to save. That will give you a specific page with a permanent link to the item that you want to save. You can also mail a particular entry to someone who you think might have an interest in the topic by clicking “link” under each post, and scrolling to the “mail this entry to a friend” option. Or you can simply copy and paste the address for that particular entry into your own e-mail. You can comment on entries by clicking “comment” – we’d like to hear your opinions and we’d value any input that you have. We ask only that you supply a valid e-mail address. If you have a website, feel free to include the URL. We do reserve the right to delete commercial or non-related posts, however. In the right hand sidebar, there are a variety of tools and resources. You can learn more about weblogs, search our site or our archives, find links to other related weblogs, or find links to a vast array or workers compensation-related sites and resources. You can contact the authors of individual posts by clicking on their name under the specific entry.